This week’s project was planned for about four weeks because I wanted to do it as a surprise for my husband. 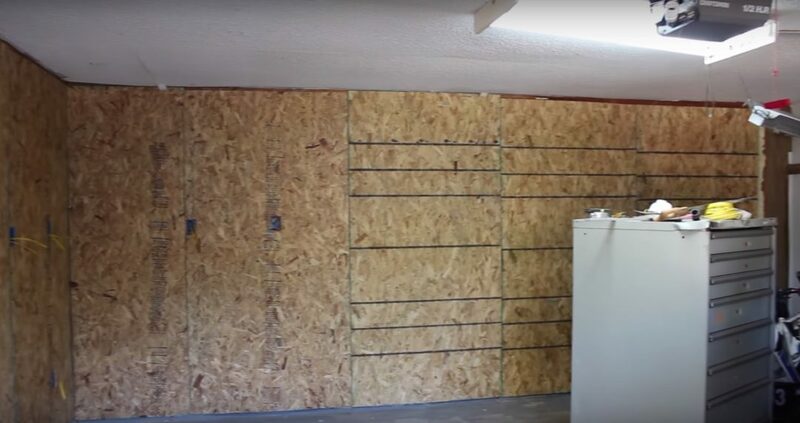 My husband is a gear head and his shop is the attached two car garage, we plan to install a mini split in his garage but as his garage is right now, it would be pretty pointless because he has two walls that are not insulated. 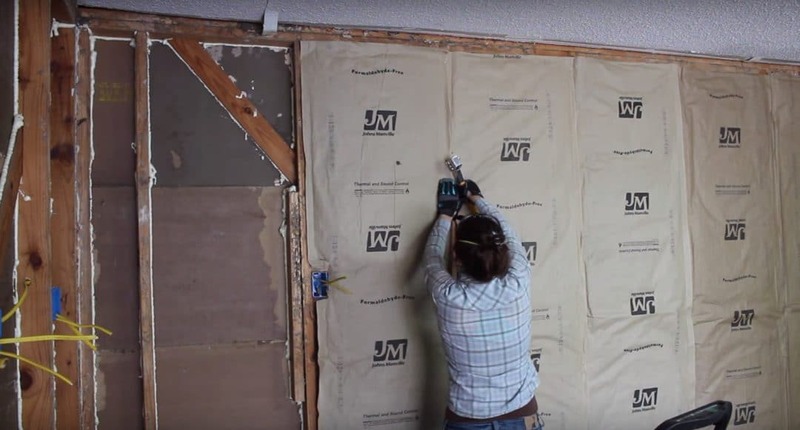 So I’m going to walk you through how to tear down the sheetrock, how to add in a few more outlets, how to insulate using pre-cut batts, and will also show how to install OSB panels instead of using sheetrock. : ) Lets get going. Here is a video giving you an overview of the build process. For this step, I recommend using a dust mask and gloves. 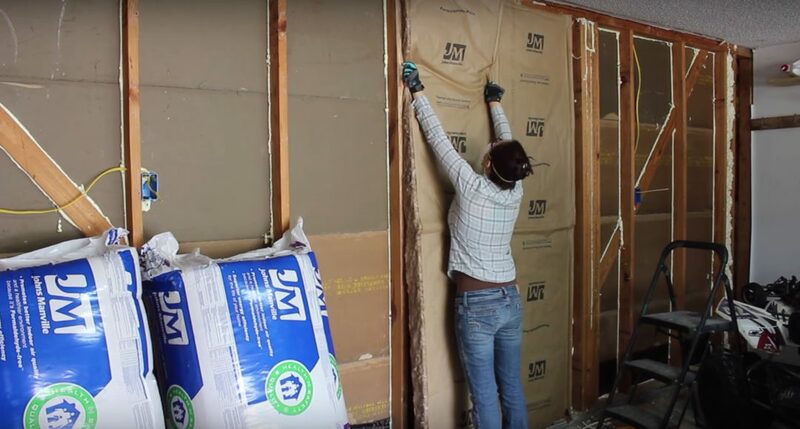 Ripping down the sheetrock was pretty much the easiest part of this whole job. First, you want to move everything off the wall so you have plenty of working space. Then make a hole using a hammer. 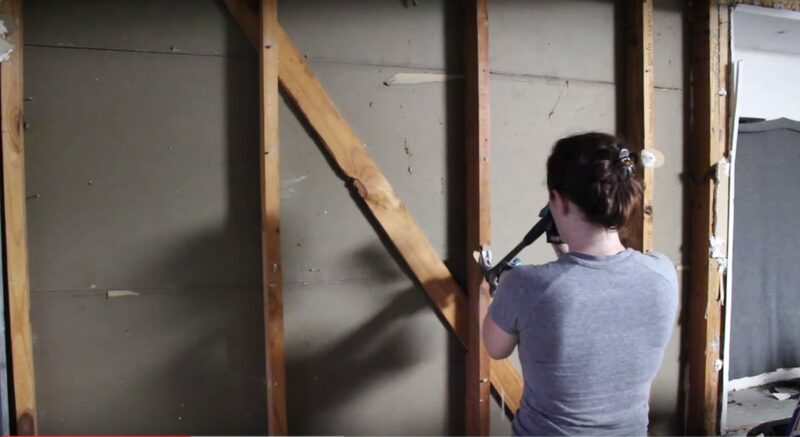 LIterally, just smash the hammer into the wall until it breaks through the sheetrock, it’s pretty easy. Now you can just grab the edges and start pulling. It was surprising how big of sheets the sheetrock came down in. I also used a flat bar to work under the sheetrock and just kind of lever it off the sheetrock screws that are holding it to the studs. 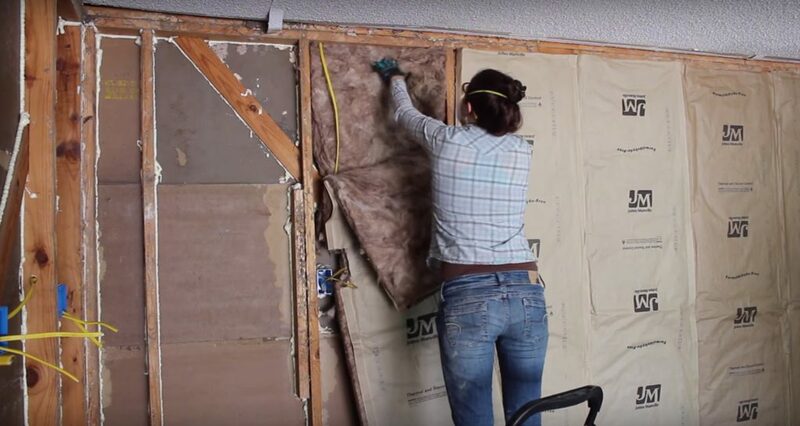 Just go through the whole garage, ripping down the sheetrock off the walls that you want to insulate and replace. I had a window in our garage, so I went ahead and ripped out all of the sheetrock off the bay window as well. 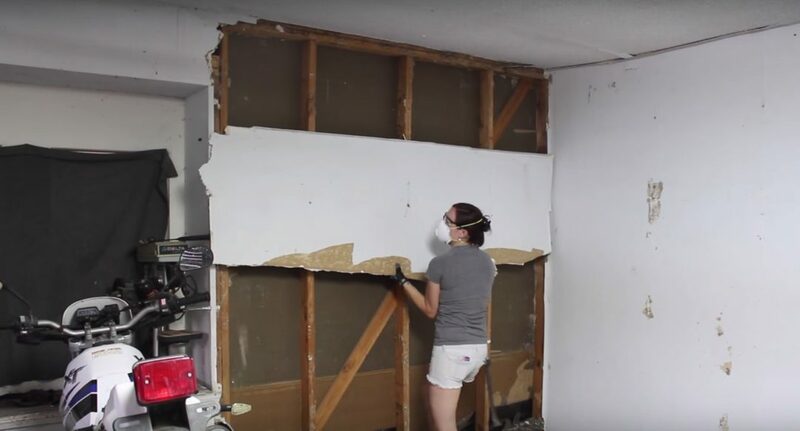 After everything was ripped down, I loaded the sheetrock into the bed of the truck and then the next day, took it to the dump and off-loaded it. 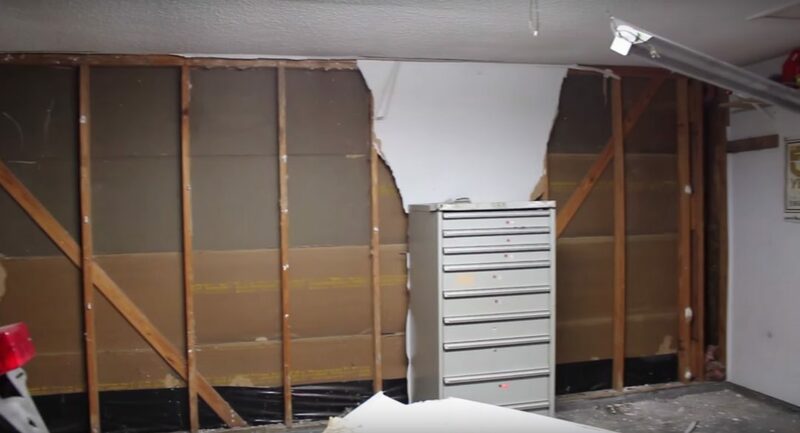 With all the sheetrock removed, I went through and used a hammer to take out all of the nails that were in the studs (from holding the sheetrock onto the studs). 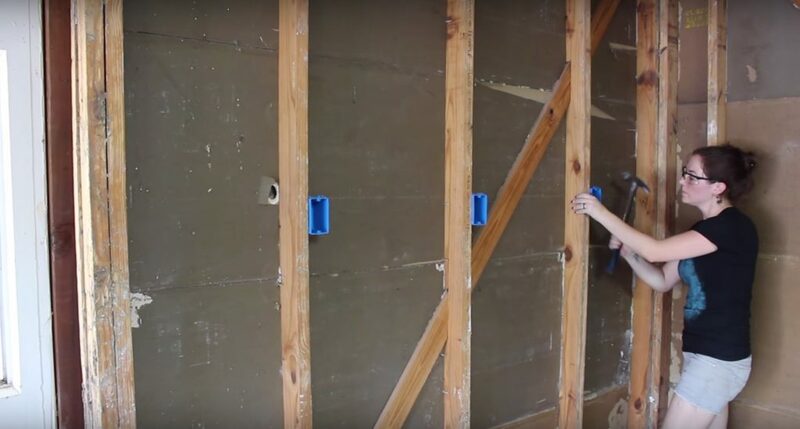 You need to make sure to get all of the nails, or when you go to re-deck the walls, you’re not going to be able to have the material sit flush on the studs. What I did was just rip the nails out and let them fall onto the garage floor, to make it go quicker, but then I came back at the end of the night and swept the garage floor really good so we wouldn’t end up with any flat tires then just threw the nails away. I am not going to go through the entire process yet because I was not able to finish. I am not very knowledgeable yet on electrical work, so all I did was lay the ground work so that my husband can come back, (or me) and finish it up later. However, since the walls are already down to the studs, I wanted to go ahead and add in a few outlet boxes. I used this book for reference and it was very very helpful! I went to the hardware store and grabbed a few blue, single outlet boxes and nailed them to the studs where I wanted to add the outlets. I ended up adding ten additional outlets total. Previously, he only had one outlet, which of course is not enough. The blue boxes come with two nails on the sides and a little gauge indicator, for you to get the depth correctly. My sheathing that I will be putting up, the OSB, is 7/16″ thick and this little gauge indicator is 3/8″, so I went ahead and used it. You put the box against the stud and make sure that those indicators are resting against the stud. This will make sure the box is 3/8″ off the stud, then use your hammer and hammer down the two nails that come attached to the box. I placed my outlet boxes kinda high up on the wall, because I know my husband has a lot of dirt bikes, 4-wheelers, mountain bikes and a whole bunch of other things along the lower portion of the wall, so I didn’t want to put outlets down there and make it difficult for him to get to them. I also knew roughly the height of his workbenches so I made sure to place these outlets above his workbench height so he would be able to easily get a plug to them. 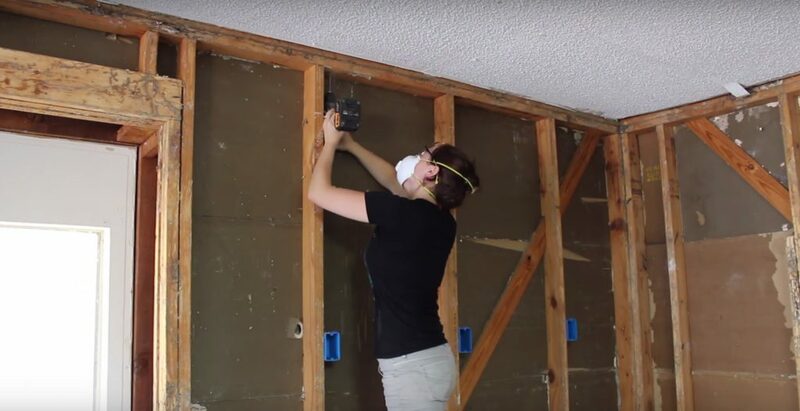 So just think about how your garage is set up and make your outlets height accordingly. Next, I grabbed some 12-2 Romex wiring and started in on the wiring. We only have one breaker, a 15 amp breaker running to the garage right now, so we will have to run new power from the breaker to the garage in order to accommodate these new outlets. In order to do that, I needed to run the wire somewhere that we will be able to splice into it later so I decided to do that in the attic. For the ten outlets, I created 4 different circuits. I used a 3/4″ paddle bit to drill a hole through the top plate, in the wall, and this will allow me to run a wire up to the attic that will later splice into a line ran to the breaker box. I also used the same paddle bit to drill through the studs, so I’ll be able to daisy-chain the outlets together, with the Romex wiring. I left about 4′ of wiring up in the attic, so we will be able to use that later to make all of the connections. Then I came down into the first blue box and I left about 6″- 8″ of wiring sticking out of the box. Then I ran a new wire, through the bottom of that same outlet box, and ran it through the stud and into the top of the next outlet box over, again leaving 6″ – 8″ of wire. This will allow me to later come back and wire in the outlets. 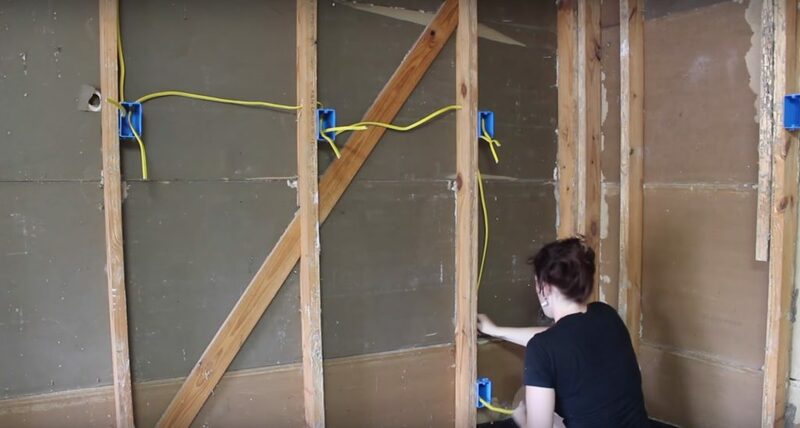 After finishing that, I repeated the process by going into the bottom of that same outlet box, cutting 6″ – 8″ then daisy-chaining over the next one to the right and repeating. All of these outlets here are going to be on the same circuit. Next I move over the next set of outlets that I want on one circuit and repeated the process. I go to the attic, leave about 4′ of wiring in the attic to use later, then I start cutting the different lengths of Romex, always leaving 6″ – 8″ of wire, to wire the outlets together. And then on the very last outlet, I ran it from the attic, straight down to the outlet box, this way my husband has the option of putting a 240 outlet here. If you want 240 ran somewhere else, then just leave a single wire for that outlet, don’t daisy-chain another outlet to that one. Also, depending on what you ran on it, you might need to run a bigger gauge wire (like 10-2). This step went really easy, however for insulation it is fiberglass so you need to make sure you have a respirator/dust mask that is rated at an N95 and it will be on the face of the respirator in orange letters. You can find these on the paint aisle at your home improvement store. You will also need gloves, long sleeved shirt, long pants and safety glasses. 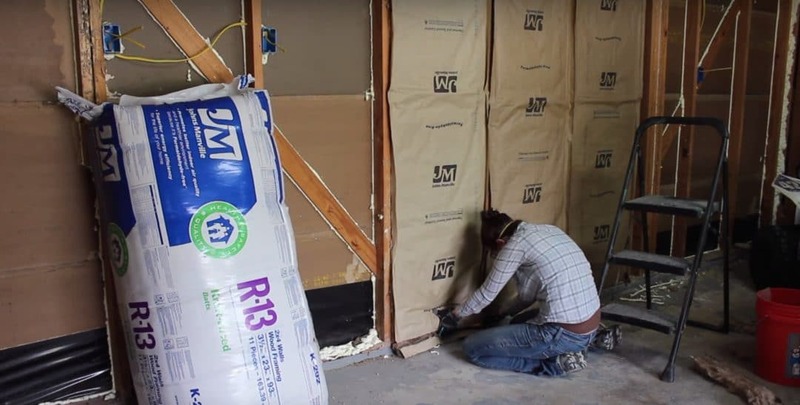 To start, cut the bag open without cutting the insulation inside and then what I did, is I started by insulating the panels that didn’t have any wiring or any electrical boxes to work around. That way, I could just take the batt and insert it into the panel without making any modifications to it. When you are installing these batts, the key is to not compress or squish the insulation, or it will reduce the R-Value. You want it to be a nice friction fit because on the other hand, you don’t want any gaps or it will again, reduce how well it’s going to insulate your space. So to get a nice friction fit, you put the batt into the panel and then just tuck in the edges. If the batt is too wide, then you’ll have to cut it down. If the batt is not wide enough, then you’ll need to go get batts that are wide enough. If the batt is too long, then use a box blade and cut it down to where it fits nicely. All of my batts, even though they are for 8′ walls, they were about an inch too long. I used a box blade to just take off the very end, and then just tucked in the bottom. After I put two panels next to one another, I came back with a stapler that I purchased at the hardware store and stapled the paper flanges to the face of the stud. 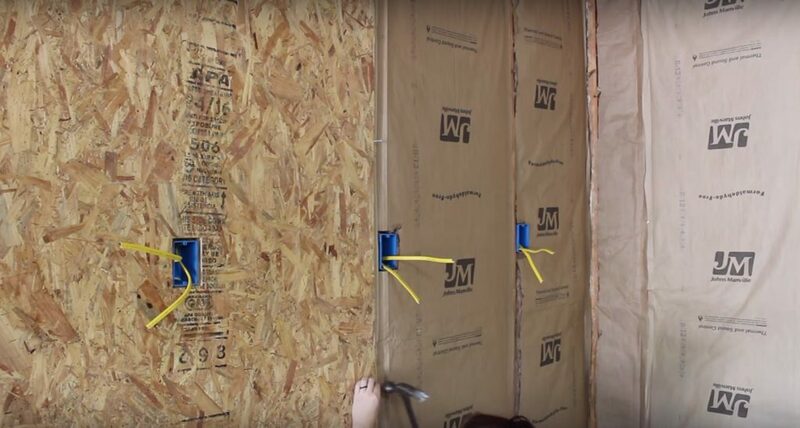 Now, there are two methods to stapling these flanges and I believe a lot of contractors go to the inside of the stud, instead of on the face so that it doesn’t interfere with the decking process. So you can staple these on the inside of the stud if you would like however I decided to go on the face. If you do that, just make sure the staples go in all the way and are flush. For the panels with outlets, I would first put the batt in place then use my box blade to make shallow cuts for where the outlet fell. Then I would take the batt out of the panel and use a hard surface to finish making the cut all the way through the batt. Place the batt in the panel and just make sure that the hole you cut fits snugly around the outlet box. If it doesn’t, then grab a scrap off the floor and cut one to fit. If you have wiring, then you can either make a slit along the back, to compensate for the wire or you can take the batt and split it into two, then run the back portion of the batt behind the wire, then fold up the front portion to go in front of it. This is the option I went with. Then you can repeat the process by stapling the flanges to the stud. 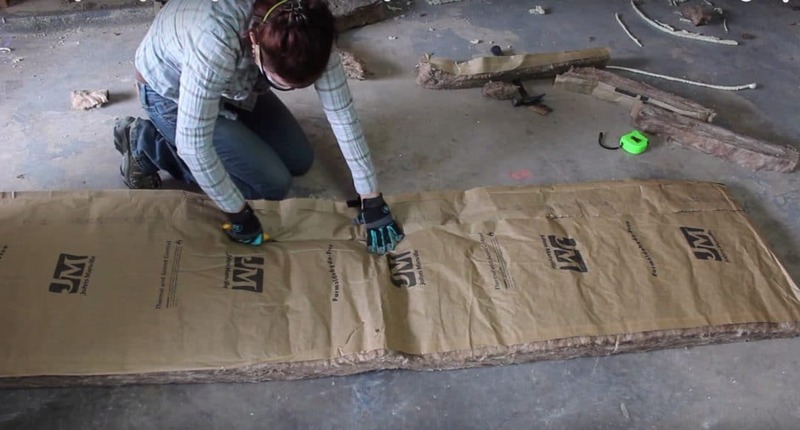 For anything that is kind of oddly shaped, I had a few squares and narrow panels around my window area, you just want to lay the batt on the ground and again use a box blade to cut it down to the size you need. I would first measure my space and then cut the batt to a 1/4″ larger than what it needed to be, so I could make sure it would be a nice friction fit. All in all, I’ve never done insulation before and I was working all by myself and it took me five hours to do the entire garage. I don’t think that is that bad but since you have to wear so much gear, I would try to wait until a semi cool day so you aren’t sweating like crazy. 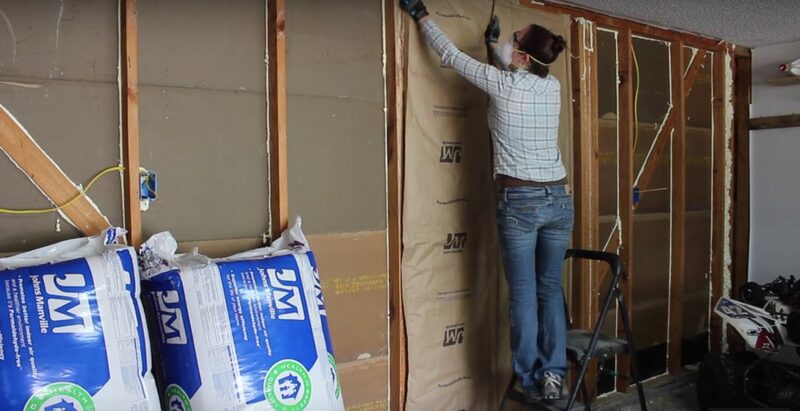 I decided to go with OSB panels instead of putting back up sheetrock because with OSB you can put a nail or a screw anywhere you want versus having to find a stud. If you do not like the way OSB looks, of course you have the option of painting it however my husband likes the way it looks so he does not want his painted. When installing these, it is supposed to be the horizontal line side facing out and I accidentally installed four of the panels backwards but it’s not a big deal. Also, you can hang these horizontally and those vertical lines are supposed to line up with your studs whether they are on 24″ centers or 16″ centers. However, since I’m working by myself, there is no way I would be able to get the top panel on without any help. So that is why I decided to hang mine vertically. Either way will work. 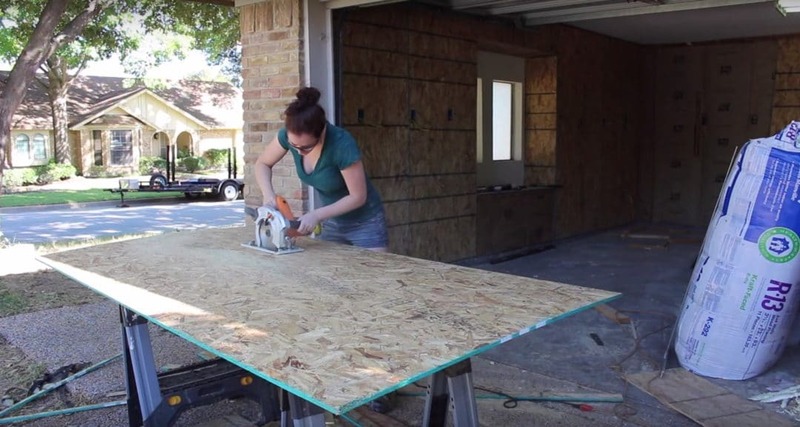 So what I would do is I went to the store and I bought eleven panels of OSB for my garage then off-load them one by one. I would first measure my wall where it was going to be hung and then I would cut it down to size. If it needed trimming I would use my circular saw. If it had an outlet, I would locate that onto the board and then use a pencil to mark out the entire square, then use a jig-saw to cut out the rectangle. Moving these sheets by myself was a difficult job but it definitely can be done. I would move it into place and to get the height right, at first I would set it onto two 2″ X 4″s, then use two more 2″ X 4″s to kind of act as a lever so that I could shift it up into the height that it needed to be at. 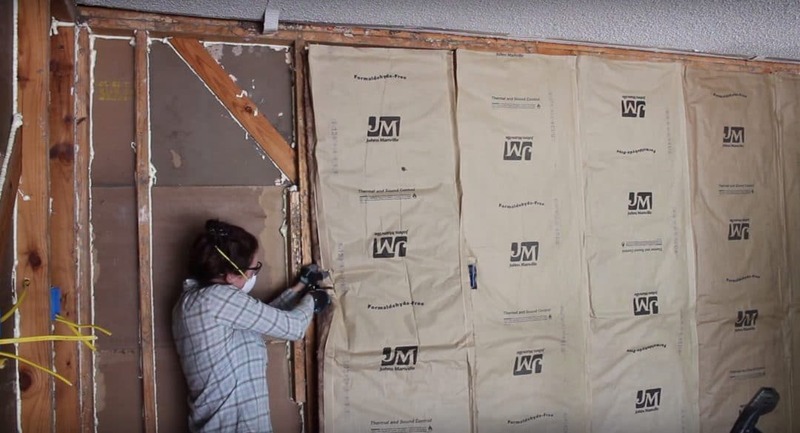 I actually ended up cutting off 1″ from the top of all the panels which leaves a gap when up on the wall however it is much easier to get into place, and it’s nothing that coming back and adding moulding, won’t hide. So I recommend doing this as well, to save yourself some time. 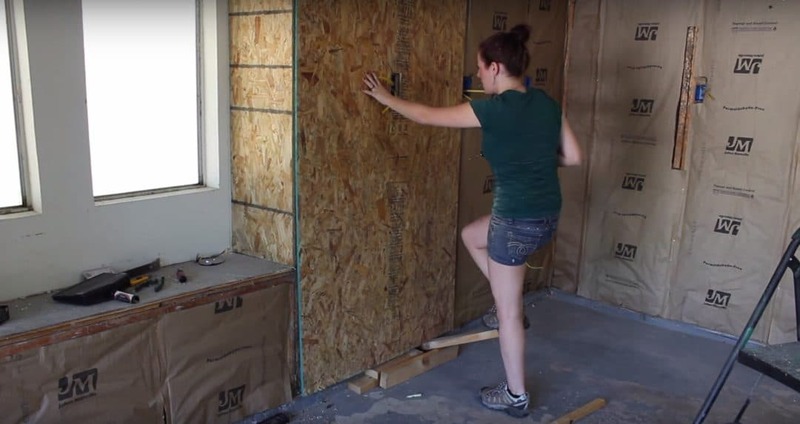 It was a very difficult step because it is an older house and the walls are definitely not square. I went through the entire garage and just repeated the process. Once I had the panel in place, I would make sure I brought my drill and two screws with me (putting the screws in my pocket and my drill hooked on my back pocket). Once I got the board to the height that I needed it, I would tack it down in two places, then step off the lever, and finish tacking it down around the perimeter and along the studs. These need to be spaced apart 1/8″ because they will eventually expand, so I used some nails tacked into the stud to act as spacers. All in all, it took me around 7 1/2 – 8 hours to do the entire garage with OSB, again working by myself. Stay tuned for the finally wiring in this space as well as many future projects. Total I spent around $100 for the OSB, about $160 for the insulation, and $40 for the Romex wiring. : ) Not bad considering the benefit.